1795 – House of Commons rejects Grattan’s Catholic relief bill. 1864 – Birth in Edgeworthstown, Co. Longford of Sir Henry Wilson, soldier; chief of the Imperial General Staff from 1918 to 1922; establishes British Intelligence ‘Cairo Gang’ in Dublin. 1881 – Richard Downey (youngest ever Catholic archbishop in 1928, who reduces his weight from 18 stone to 9 stone in the 1930s) is born in Kilkenny. 1911 – Birth of Monsignor James Horan, born in Partry, County Mayo, a parish priest of Knock, County Mayo. He is most widely known for his successful campaign to bring an airport to Knock, his work on Knock Basilica, and is also credited for inviting Pope John Paul II to visit Knock Shrine in 1979. 1916 – Irish patriot and a leader of the 1916 Easter Uprising, John MacBride, is executed by firing squad in Kilmainham Gaol. 1923 – A civilian Michael Reynolds is shot dead by republicans in Leitrim, who were looking for his son, an ex RIC officer. 1923 – Republicans blow up the Grand Central Cinema in Dublin. 1938 – In a House of Commons speech, Winston Churchill rails against the agreement that returns Irish ports “the sentinel towers of the western approaches” back to Ireland. Churchill appreciated the potential benefit to Britain of the ports in the event of war. The fact that Britain did not have access to the ports during WWII played a major role in Ireland’s effort to remain neutral. 1939 – Death of Mick the Miller, the greatest greyhound in the history of the sport. 1941 – Kate O’Brien’s novel The Land of Spices is banned by the Free State Board of Censors; protests will eventually lead to the setting up of an appeals procedure. 1949 – Ireland one of ten founder members of Council of Europe with HQ in Strasbourg. 1965 – Birth on Belfast of Norman Whiteside, Manchester United, Everton and Northern Ireland footballer . 1999 – The remains of celebrated British actor Oliver Reed arrive in Ireland and are taken by hearse to a funeral home in the North Cork town of Buttevant, not far from his Castle McCarthy home in nearby Churchtown. 1999 – Prince Charles visits Omagh and meets with relatives of those killed in the 1998 bombing and some of the young people who were injured. 1999 – A team of security personnel from the White House arrive in Galway to prepare the city’s National University for the visit of First Lady Hillary Clinton. 1999 – Sinn Féin leader Gerry Adams suggests that full implementation of the Good Friday Agreement could mean the end of the IRA. 2000 – Hopes for a breakthrough in the peace process grow as high level talks at Hillsborough Castle overrun their expected timeframe by several hours. 2003 – It is announced that almost a year after his death, two unpublished plays by John B Keane have been discovered in his study and will be staged when his widow, Mary, decides the time is right. 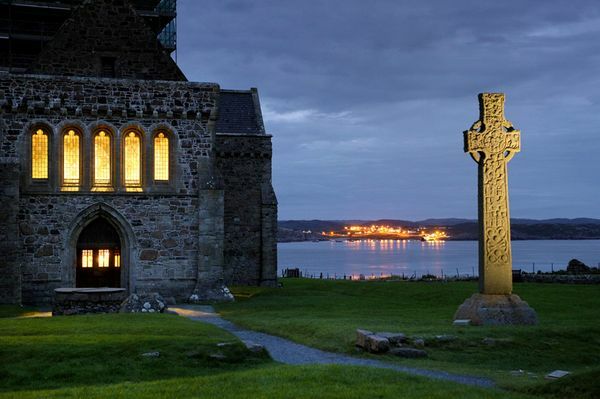 Photo: A Celtic cross stands against the evening sky on the Hebridean island of Iona, Scotland.